hundreds of hours of work. When the world seems to be falling apart all around us, depth psychology provides perspectives and tools that can help us make some sense of things, even in some small way. Through the study of the unconscious, we can often get a glimpse of patterns at work, or underlying aspects that help us gain a new understanding of how we are truly supported by something larger—how the boundaries and attachments of our ego selves can soften and give way to soul, which sustains us.In many ways, depth psychology can be seen as the great unifier. When applying a depth lens to virtually any topic, we begin to peel aside the layers to understand what lies beneath, and the voices at the margins begin to be heard. 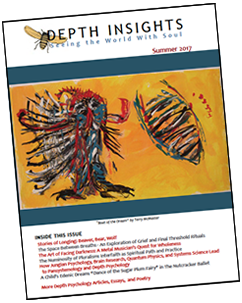 In this issue of Depth Insights, we encounter a variety of topics which, when we apply a depth psychological lens, we begin to understand at a deeper layer. Several of these seven compelling essays build on the authors’ personal experiences in order to truly explore the many ways soul reveals itself in our lives and in the collective. Others offer a broad academic view that integrate philosophy or systems science with depth psychology to further enrich the lens by which we might perceive soul at work in the world. Nicole de Bavelaere offers a new model to investigate how systems science can address problems highlighted by psychology in this article that explores her revolutionary notion of pansystemology. “How Jungian Psychology, Brain Research, Quantum Physics, and Systems Science Lead to Pansystemology and Depth Psychology” builds on the work of Einstein’s protégé, David Bohm. In “On Romanticism in Jung’s Psychology: A Reflection on The Passion of the Western Mind,” Ron Boyer seeks to understand the role of Jung’s depth psychology within the philosophical lineage of Western thought in a reflective essay based on the iconic book by Richard Tarnas. In “The Art of Facing Darkness: A Metal Musician’s Quest for Wholeness,” Colin E. Davis engages his own passion for heavy metal music and probes its symbolism as a refuge for cultural outsiders. He employs the late Jungian analyst Robert Moore’s model for male archetypes in order to observe the shadow patterns that show up in the genre and often in the lives of those who love it. Finally, Mary Ann Bencivengo “A Child’s Edenic Dream: ‘Dance of the Sugar Plum Fairy’ in The Nutcracker Ballet” offers a mythopoetic, Jungian analysis of the popular ballet. Several numinous pieces of poetry and art round out this depth psychological offering, including the stunning cover art and accompanying works by Terry McMaster. It is my hope that reading this issue might reconnect each of you, dear readers, with a sense of soul in the world and everyday life—a respite and touchstone of strength and comfort so greatly needed in chaotic times. Depth Insights Journal is published twice a year. Note: Opinions expressed by the authors contained in this issue do not necessarily reflect those of Depth Insights or its editors, publisher, or representative. Copyright of content remains with the authors & artists. Copyright of the Depth Insights Journal and design belongs to Depth Insights™. No part of this publication may be reproduced in any form or by any means without written permission from the publisher.